Architectural molding, Trestle feet, tempered glass mirror conspires to make this adjustable cheval mirror an indispensable part of your daily toilette. The real undercover Conspiracy is that it opens to reveal a felt-lined interior complete with trays hanging hooks and another inside mirror for storing and auditioning jewelry. Curve top design in elegant Dark brown color matches any decor of the house. 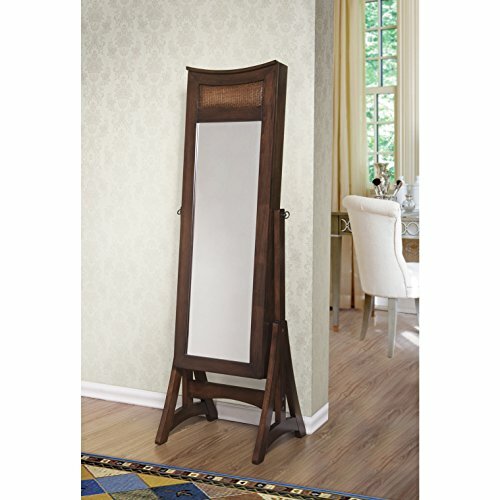 Made from the best craftsmanship, this tasteful mirror jewelry armoire will keep its contents safe. Enjoy the beautiful workmanship put into this luxury jewelry armoire cheval mirror as much as the amount of treasured items you can store in the spacious and felt lined sections including finger ring pad. Entire cabinet is constructed of MDF legs and horizontal bars are made of solid wood modern finish on classic cheval armoire full-length tilting upgraded mirror (3mm thickness)necklace hooks for tangle-free organization pocket shelves store bracelets or other loose pieces inside mirror (2mm thickness)sturdy packaging. Packed in drop-tested shipping box. If you have any questions about this product by WUnlimited, contact us by completing and submitting the form below. If you are looking for a specif part number, please include it with your message.